A special thanks to Kevin Reed, who lives in Bisbee, Arizona, for his input for this page. El Angostura (the narrows) is a lake in northern Sonora on the Yaqui River. The lake is some fifteen miles long and about a mile wide at its widest part. It is over a hundred feet deep in the canyon nearer the dam. When the lake is full, as it is now, it backs up into the river and makes for good camping and launching at La Playa (the beach). There are zero facilities there at the lake, so all your gear must be hauled in for camping. The scenery around Angostura is breathtaking - with eight thousand feet high, El Tigre, on the back side. An abundance of wildlife and magnificent cliff and rock walls stretch for miles on the north side of the lake, some of them shaped like castles or figures of rock heads hundreds of feet tall. You won't want to leave your camera at home. Boating back into some of the coves with tall cliffs on both sides presents an awe inspiring view. Kevin Reed with a couple typical Angostura bass. The lake has been a good bass fishing lake for many years along with good catfish catches. More recently the lake has been stocked with tilapia. The tilapia fishing hasn't quite caught on yet, but soon should once they have had a chance to mature and multiply. This can only mean good things for the bass population. The tilapia being caught appear healthy and normal size. The locals claim that three different types of tilapia were stocked two years ago - one of them being the larger, white, frying pan sized tilapia. Others report that some Florida-strain bass were also stocked. It would appear that good things are on the horizon for Angostura. Angostura is due south of Douglas, Arizona. One can get there by crossing the Arizona/Mexico border at Agua Prieta, Sonora Mexico. One can also cross the border at Naco, then proceed to Agua Prieta by traveling 9 miles south to Mexico Highway 2 (Carretera Federal 2, Juarez Cananea). Turn left on Highway 2, heading east, and travel approximately 23 miles toward Agua Prieta. Once you reach the outskirts of Agua Prieta, you turn south to Esqueda. You actually do not go into Agua Prieta. One distinguishing marker for the turn/off to Esqueda is the military facilities nearby the intersection. It has a gigantic flag waving. You cannot miss it! 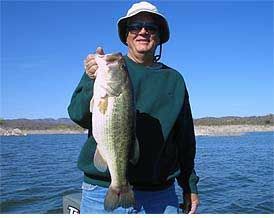 If you are a first time traveler to the lake, you will want to go through Douglas, AZ and cross the border at Agua Prieta, in order to secure the necessary permits. Parking is limited in front of the customs station, but there is ample room in the rear. Travel south from Agua Prieta on the Agua Prieta/Nacozari De Garcia highway for 48 miles (a good-condition highway) to Esqueda. There is no sign at Esqueda. It isn't a large town - several thousand people. Once you drive over the railroad tracks, you take the first left turn and then turn right at the church. From there it is a straight shot to the lake. Follow this dirt road for nineteen miles. The road conditions depend on how recently it has been graded. The road meanders throughout the mountain range and there definitely are some rough spots and some hills to climb. Four wheel drive is highly recommended. Local ranchers use the road quite extensively, so it does get graded occasionally. Once you get to the lake, the ride will have been well worth the effort. Catches of fifty or more fish per day are common. Typical size ranges from 2 to 5 pounds, with an occasional bigger fish in the 7-pound range. I have made two trips per month to Angostura since February of this year. My most recent being last weekend. The numbers of fish being caught has been up, but the larger ones have been harder to come by. The water temperature stayed cool for a very long time due to the frequency of passing storms and relentless wind. It finally reached 72 degrees just lately. From now until August the lake is closed to fishing for all tourists and locals for the spawn. This includes catch and release for reasons unknown. This decision was made by an inspector representing SAGARPA. ( Sonoran agriculture and fishing ). The lake level is down maybe twelve feet from overflow, which is still plenty of water available for launching at La Playa. After the rains come in July it should fill again. A Mexican fishing license is required to fish anywhere with Mexico. They can be purchased online at various web sites. Two years ago the necessary boating permit was done away with, however main vehicle and trailer permits must still be purchased. A six month permit for your truck runs just over fifty dollars and must be put on a credit card. Kevin Reed, second week of December, 2010. Another nice trip to Angostura. 58 total for two days. Twelve over four pounds. 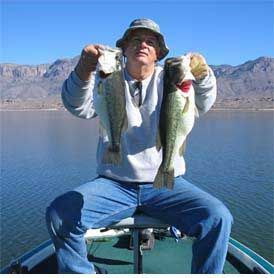 Fishing license and boat permits are required in Sonora. You will need to have a vehicle and boat permit purchased at the Mexican border in Agua Prieta at Customs along with a personal visa. This requires Vehicle titles, a birth certificate or passport (or passport card), a credit card for the purchases and drivers license. They can be renewed every six months. The cost for a vehicle permit is between twenty and thirty dollars. You will also need the registration for the boat trailer. The customs office has a bank in the same office which makes it real handy. For fishing in Mexico, a Mexican Sport Fishing License is required. Additionally boating permits may be required to fish Angostura lake in Mexico. Bass Fishing in Mexico At Angostura.